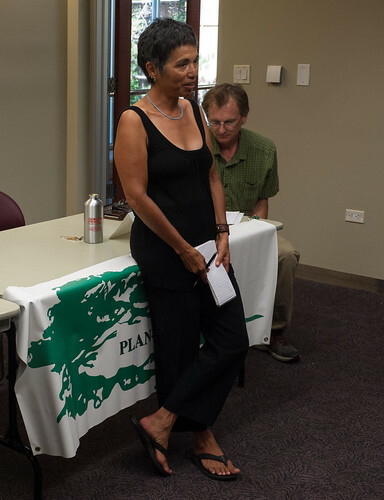 Friday, September 6th saw the first of PLAN-Boulder County’s City Council Candidate Fora for 2013. 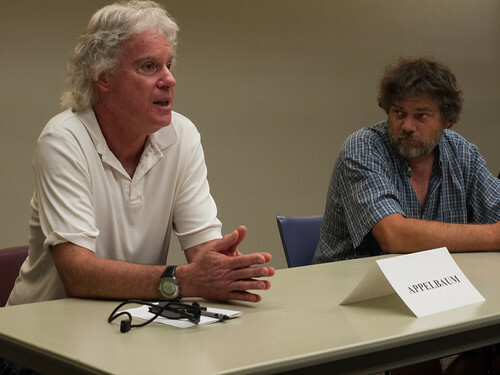 The moderator was PBC board member Jeff McWhirter. The candidates on hand were incumbent (and mayor) Matt Appelbaum, Planning Board member Mary Young, and perennial hopeful “Greatful” Fred Smith. Each candidate was given two minutes to introduce themselves, and then all of them were given the opportunity to answer a series of questions from the moderator. After about an hour, they moved on to written questions submitted by the audience and selected by the moderator. 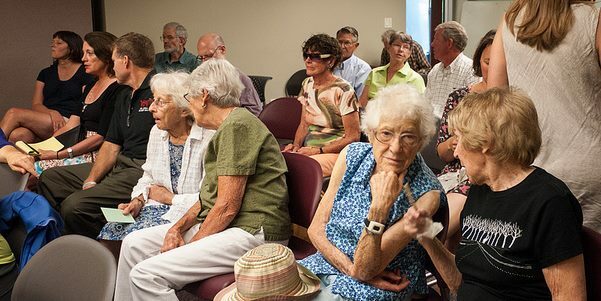 Matt noted that it had been almost exactly 30 years since he attended his first PLAN-Boulder County luncheon, and that he’d spent nearly half of that time on council. He said that he’d probably annoyed just about everybody in the room at some point during his tenure on council (“which is as it should be”) and admitted that while of course there have been mistakes throughout the years, the city has also made a lot of progress on controversial issues. He pointed to the city as a leader on urban growth boundaries, alternative transportation, climate change and energy (true when compared to peer cities in the US, but harder to back up in a global context). Then Matt ran out of time, unsurprisingly, only halfway through his introduction. PBC board member Alan Boles was a ruthless timekeeper. And I have to admit, it was a little bit fun to see Matt held to the 2-minute time limit often applied to public comments at City Council meetings. Fred was proud of the vibrancy of Boulder’s democratic participation—that people are relatively engaged, and get out and vote. At the same time, he pointed out that there’s much room for improvement, especially in off-year elections. He said voter turnout in 2012 was about 75,000, but in the last council election (2011) it was more like 30,000. Fred defended himself against the suggestion that he was simply seeking the votes of the young and otherwise disenfranchised, instead focusing on the need to improve overall political participation. He pointed out that many of the city’s funding mechanisms—especially sales taxes and use fees—end up being regressive, and suggested that a city income tax would be a more progressive and preferable source of revenues. In closing, he said he’d like to see the drinking age in Colorado lowered from 21 to 18, bringing college binge drinking out of the shadows and removing some of alcohol’s cool factor as a forbidden item. Mary came out in front of the dais to address the room. She began her time in Boulder as an engineer 30 years ago, but soon thereafter moved on to working in the non-profit sector and public service—with Growing Gardens, Via Mobility, and most recently on the city’s Planning Board. Why is she running for council? Because she just loves public service, and wants to continue serving. Q1: What do you like or dislike about the new Civic Center plan? Fred Smith focused primarily on the public process that surrounded the Civic Center planning, and held it up as a model of good public engagement. Matt Appelbaum also said the public process around the planning effort was really good. He was glad that the new plan opens up the area, replacing surface parking (which he said really has no place downtown) with more compact structures, and more parkland. He said we’d never be able to avoid all of the flood issues downtown, but that certainly the new plan ought to do better at addressing them. While happy to see that we were potentially adding more arts, science, and meeting spaces, he cautioned against overbuilding the area, and wanted to make sure that it got the feel right. He also pointed out that we need to actually be able to afford the redevelopment. Q2: What are the bigger regional or state issues? Fred Smith responded immediately: housing and traffic—especially traffic to and from Denver. He was glad to see RTD’s bus rapid transit (BRT) system going ahead, and said he wanted to get more people on buses and bikes, though he admitted he wasn’t exactly sure what the best way to do that was. Smith also pointed out that many households spend close to half of their incomes on housing in Boulder, and said we ought to do more for affordable housing. He said increasing the minimum wage within the city would help. Matt Appelbaum continued in the transportation theme, and lamented the apparent breakdown of our regional transportation planning efforts. He said we needed to do a better job of getting the surrounding counties in the region to buy into our progressive transportation agenda. Mary Young voiced her strong support for a community-wide EcoPass program, giving the entire county unlimited access to transit. Q3: 40% of trips in the city of Boulder are less than 2 miles. What do we need to do to shift those trips toward walking, biking, and transit? Matt Appelbaum said we need to make it as easy as possible to not drive. And (somewhat begrudgingly) admitted that we probably also need to make driving less convenient. He said we need to complete the bike and pedestrian networks, and get our “complete streets” built out. He was also in favor of the community-wide EcoPass… assuming that the price comes back from RTD negotiations looking reasonable. He said we need to be very careful about wielding “sticks” to change transportation behavior—that it’s important to make sure the alternatives really are in place before nudging people to use them. Mary Young said we focus a lot on the able bodied, mobile population, and that we ought to be careful to ensure that our transportation systems are accessible to everyone, as a significant chunk of our population is beginning to age. She suggested that if we build a system that works for even the most vulnerable populations, it will work for everyone. Fred Smith was a little bit critical of the B-cycle bike program, and said we ought to just have free bikes everywhere. At the same time, he said that you can’t really force people to ride bikes or the bus—that too much pressure just results in backlash. Q4: There seems to be a lot of contention between the various users of our open space and mountain parks. What’s the right balance? Mary Young thought that we’ve had a good balance so far. She was pleased with how the West TSA study went, and felt that it came to the right conclusion. She urged people not to blame poorly behaved dogs on trails, saying that what we really need to do is train their owners. She also thought we could probably do a much better job of educating the student population about trail etiquette. Fred Smith took an explicitly conservative position—that whenever there was any doubt or controversy, we ought to err on the side of prohibiting uses, including dogs and bikes. Matt Appelbaum said open space access has been contentious for 40 years, and he anticipated that it would remain contentious for a long time to come. Nevertheless, he said that so far the balance has been pretty good. He said it was important to keep people off the majority of the land for habitat conservation, but that people needed to have some access, or they wouldn’t continue to support the program. He projected that increasing usage of the open space would pose problems in future years, and suggested that we could do better (and fund more) education, outreach, and management of the system. Followup Q4.5: What about habitat conservation areas (HCAs)? Matt Appelbaum said that the HCAs were really only for very special purposes, like the raptor nesting closures, but added that he felt it was important to keep people on established trails. Fred Smith re-iterated his willingness to restrict access to open space whenever there was some ambiguity. Mary Young almost seemed to want to one-up Fred, and suggested that we might restrict night time usage of the open space trails in order to allow the wildlife some quiet time. Q5: Is the current OSMP funding/acquisition plan sufficient? What about the possibility of a trail to Lyons? How should we interact with other agencies county-wide? Fred Smith said that the more money we’ve got available in the open space trust fund, the better. There were still many desirable properties that could be purchased. He said we should be very careful not to lose the opportunity to permanently preserve these lands. Matt Appelbaum was in favor of funding the open space vision, and said it was incredible to be nearing the completion of the plan, which had certainly expanded far beyond the initial expectations anybody might have had when the journey began. He said we should celebrate how far we’ve come, and that while there will always be some properties that come up that we might be interested in, that we can’t buy everything—not everything is for sale! Mary Young was in favor of buying an agricultural easement on the Long’s Garden property. She didn’t think that the current tax proposal actually supports the vision plan, but that it does preserve OSMP’s bonding capability, which was very important. She was in favor of continuing opportunistic property acquisitions. Followup Q5.5: Should we be funding “urban open space” and urban agriculture? Fred Smith: If we want to support urban agriculture we might levy a small tax on non-local grocers and the profits that they export, and use that revenue to support urban agriculture and open space. Matt Appelbaum: We should definitely acquire Long’s Gardens. We will. But it’s not really an open space purchase, it’s a Parks and Rec purchase. Urban ag means different things to different people. Long’s isn’t really market scale, it’s much more useful for outreach and education. We should consider having more community gardens too, but again, that’s Parks and Rec, not open space. And if we do really want to explore supporting urban agriculture, we should look at what other cities are doing. Greenhouses can work well in our climate, and be highly productive for the land area they take up. But all this would need to be part of a much larger discussion. Mary Young: We wouldn’t really be deviating from the Open Space vision in acquiring Long’s Garden, and it’s quite a big parcel—about 25 acres. It’s also an important part of our history. Q6: What city programs are most underfunded, and how would you fund them? Matt Appelbaum: I’d prefer that we invested more across the board to reduce greenhouse gas emissions. We should be doing more to preserve and encourage more diversity in Boulder. Transportation (also part of our emissions profile) can certainly use more funding, especially regional transportation. It’s also an important contributor to the livability of the city. Mary Young: I met with Bob Eichem a couple of weeks ago, and talked a lot about how the city operates, and was surprised to hear that Boulder’s habit of using ongoing funding sources for ongoing expenses (like O&M) and one-time funds for one-time expenses (like capital improvements) was actually pretty novel! We have high expectations of service in Boulder, and that’s expensive—we have to be willing to pay for that service. We could be doing much better with transportation—I’m supportive of the 0.15% sales taxes for transportation that are on the ballot this fall. We also need more policing of all the folks hanging out in the Civic Area. Really there are only a couple of ways to raise additional funds: sales tax or maybe property taxes. Fred Smith: We should help the homeless, many of whom are mentally ill—just like me. In the end, untreated mental illness and homelessness ends up being ten times as expensive as treating it. People need treatment, and a place to live. We’re much better than most of Colorado, but that’s really not saying much. Q7: What’s your position on the Area III planning reserve? Mary Young: The four-body-review process has been successful for decades, and we should keep it. Area III really shouldn’t be developed—if we need more space for development, there’s no shortage of surface parking within the city’s borders that can be redeveloped. Fred Smith: Lots of people have told me developing Area III would be a bad idea, and that the review process we’ve got now is good. I’m generally against rapid development of any kind. Housing isn’t expensive here because there’s a shortage of it, it’s expensive because this is a nice place to live! It’s not just supply and demand. Matt Appelbaum: I could imagine an unexpected opportunity for Area III… but boy, I sure haven’t seen one in the last 20 to 25 years. There’s no rush—we can (and should) hold out until something comes along that is just irresistibly awesome. Certainly it shouldn’t just be another suburban residential development. That said, I think the city should have the power to determine it’s own growth boundary, and this area is clearly within ours. Q8: Boulder has plenty of housing for the affluent, and a decent affordable housing program serving the lower end of the economic spectrum, but the middle of the income distribution is a little sparse. How should we provide more housing for middle-income folks in Boulder, including young families? Mary Young: We’re not very welcoming to people just coming out of school. We could do much better. A lot of them just can’t live here because of the price. There’s actually lots of racial and ethnic diversity in town, and the way they manage to afford living here is by having lots of people under one roof. One potential solution we should look at is making it easier to build ADUs (accessory dwelling units). They can increase affordability for both renters and the landlords who rent them out. ADUs would also help the elderly age in place. Matt Appelbaum: I’m afraid of our losing the middle class in this town, and it’s really the heart and soul of the community. It seems like when we densify here, all we get is million dollar townhomes and condos, and unfortunately there’s little we can do in the face of that market. We also tend to be against building more density near us… which makes adding new housing difficult. 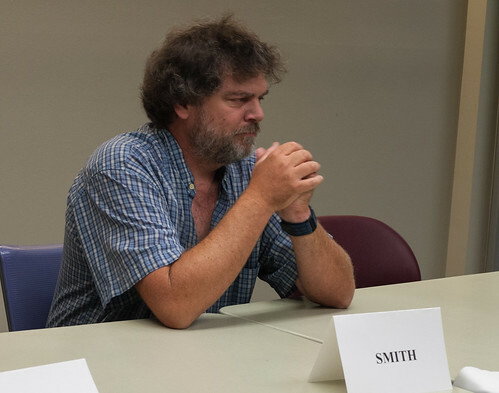 Fred Smith: A single person or a couple can get by living here, but trying to have a family is difficult, if you want to do it in a house with a yard. Our population is aging because young people can’t settle here. Q9: Why are you running for City Council? What resources and experience would you bring to the job? Matt Appelbaum: We’re working on a lot of important things right now—low carbon energy for one, with or without a municipal utility. We’re also trying to figure out if it’s possible to make housing affordable in a small, urban community. There’s lots of interesting work to be done here, and I want to be part of it. Fred Smith: I gotta be honest, and say probably more than anyone else… I’m in it for the money (laughter). I like working with people, and work well with others. I appreciate Boulder taking me in after I spent time in a state mental institution, and I really just want to give something back. Mary Young: I’m really interested to work on equity and transportation. Initially I had thought that I would run for the RTD board next year, but someone on City Council said that I could do more good here, so I decided to give it a shot. Q10: What will happen if both measure 310 and the city’s measure 2E fail on the ballot this fall? Mary Young: If both of them fail, we’re just going to continue on the path that we’re on. I’ve opposed both of the ballot initiatives. Fred Smith: I’m completely in favor of municipalization—and would be even if it ended up raising our rates, and I’m not exactly wealthy. Matt Appelbaum: I oppose the Xcel initiative (Measure 310) but I’m actually in favor of the city’s issue (2E). It’s a safe way to move forward, with a reasonable cap on the acquisition costs. More than anything else though, we can’t continue the discussion about forming a municipal utility if 310 passes. It also strips us of any possible negotiating power we might have in our discussions with Xcel. Q11: Should the city ban neonicotinoid pesticides, which have been linked to bee deaths worldwide? Fred Smith: I love it when the city takes on these bigger issues and points the way for others. I would be all for it. Matt Appelbaum: There’s a line to walk, but it’s good for cities to take these kinds of issues on. The city actually already does IPM (integrated pest management) on our own lands. We have to be careful though, as sometimes cities get trumped by state and federal regulations. But it’s something we should look at, and consider working on if it’s within our power. Also, it’s worth noting that virtually any policy that we put in place ends up “shaping” behavior. It’s unavoidable, and it’s okay. Q12: The city is struggling with funding a variety of basic services, and seems very focused on OSMP. How highly do you prioritize human services funding? Mary Young: Very few cities actually bother to provide health and human services—it’s usually something left to counties and states. It’s very important for keeping the city diverse. I’d assign it a high priority. Fred Smith: Early preventative treatment via public services like the People’s Clinic actually ends up saving the public a lot of money in the long run, because it takes that treatment into a doctor’s office, and out of the Emergency Room. It’s a good investment. Matt Appelbaum: It is a good investment, but sometimes the city isn’t the right scale at which to deal with these issues. Mental illness and homelessness in particular are at least regional if not state scale issues, and without good policies in the state and county, it’s impossible for the city to bear the entire burden. Follow-up: Is there something specific/concrete that we can do about homelessness? Can we ban panhandling? Matt Appelbaum: There are actually different populations in question here—there’s a difference between the chronically homeless and the transient population that passes through town, especially in the summer. They require different solutions. Unfortunately, within the region only Boulder and the city of Denver really seem interested in dealing with the problem. We’ve tried for a long time to get others on board, with very little luck. Nobody wants to have so many of these folks that they can’t deal with it in their city. Unfortunately our peer cities don’t have a lot of easy solutions to offer up. Fred Smith: Maybe we could employ them growing vegetables, and then give the food away? That would give them jobs, and skills, and work on alleviating hunger at the same time. Mary Young: I’ve heard that panhandling can actually be a pretty lucrative job—something like $200-$300/day (better than being on council!). The chronically homeless often have mental health issues. We’ve got to work to help people further upstream—before they end up on the streets. We should continue supporting the local non-profits that work with these people. They’re a great value to the community. For example Bridge House has a good “Ready to Work” program—you may have seen them downtown and along the bike paths doing cleanup work. Q13: Have we done enough to mitigate risk in our floodplains? Editor’s note: this forum took place prior to our historic regional floods. Fred Smith: I’ve heard repeatedly that Boulder’s got “the worst floodplain in Colorado,” but I don’t know how much we should spend, or what the best approach is to deal with the issue. Mary Young: The recent flood zone ordinance that we passed should help to move critical services and vulnerable populations out of the most dangerous flood areas. I think we need to take the 500 year flood plain much more seriously, since we are likely to be exposed to more extreme weather events in the coming decades due to climate change. Matt Appelbaum: We are where we are—we’re obviously not going to move the city. We just have to live with the floods and deal with them the best we can. We already have fairly strict regulations with the prohibition on re-building in the High Hazard zones. Is it perfect? Nothing’s ever perfect. But we’re doing what we can. FEMA regularly recognizes the city’s efforts to mitigate flood risk by lowering insurance rates in the city. We have great programs, including our greenway flood conveyance programs. It’s also important to remember that 90% of the people who die in floods are in their cars. Q14: Living in small spaces reduces housing costs and also energy consumption, addressing several high level city policy goals. Should we repeal the occupancy limits that make it illegal for many people to live more affordably and sustainably in Boulder today? Fred Smith: If you’ve got a 5 bedroom house, there’s no sense in prohibiting people from living there if they want to. It shouldn’t matter whether they’re related or not. Economically it’s awful to keep these buildings under-occupied. It makes sense for the city to make efficient use of our existing housing stock. Matt Appelbaum: Yes, probably this should be looked at—but cautiously. The current rules are impossible to enforce, regularly broken, and probably unfair. Lots of college towns have these laws. We need to look at how we can change the occupancy limits but still address life and safety issues. That’s a much more important issue than on-street overflow parking. Maybe we shouldn’t do it everywhere… but in some places yes, it would make sense. Of course, it’s easy to say we should, but the reality is this is politically difficult. The same is true of ADUs (accessory dwelling units). But we should definitely look into it. Mary Young: I’d generally agree with Matt on this. I’ve visited the folks at the Masala Co-op, and it’s an awesome place! Community oriented living arrangements like co-ops can help us address the loss of our younger population. There are other traditional affordable housing types that we should look at too, like rooming houses. Fred Smith: I want to raise city revenues, and tax more fairly. I want young folks to be able to walk into a bar in their freshman year at college. But more than anything, I just want to get more people (especially young people) engaged and voting and participating in our local democracy. Matt Appelbaum: We’ve gotten to where we are because people have been thinking long term. There are lots of little niggling things that you can vote on the basis of, but what makes the city great is thinking in the long term. We’re not going to win every battle, and that’s okay. Whether it’s energy, transportation, urban governance, etc., we need to look at the big picture. We’re not “lucky” to live here—we’ve made it a great place, on purpose, and it’s taken a lot of work over decades to make it like this. Also please vote for all the ballot funding initiatives—they’re investments in our community. Mary Young: I’m really motivated by climate change. It is the issue of our time. I want to be able to consider lots of different views, different values. Whatever the outcome of the election is, I’ve really enjoyed having the opportunity to talk to so many people throughout this process.